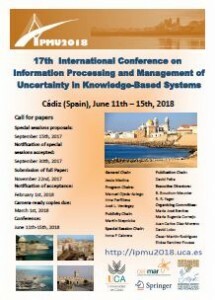 Jesús Medina, Manuel Ojeda-Aciego, José Luis Verdegay Galdeano, David A. Pelta, Inma P. Cabrera, Bernadette Bouchon-Meunier, Ronald R. Yager: Information Processing and Management of Uncertainty in Knowledge-Based Systems. Theory and Foundations Parts I and II. Communications in Computer and Information Science 853 and 854, Springer 2018. 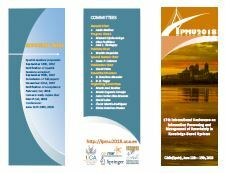 Jesús Medina, Manuel Ojeda-Aciego, José Luis Verdegay Galdeano, Irina Perfilieva, Bernadette Bouchon-Meunier, Ronald R. Yager: Information Processing and Management of Uncertainty in Knowledge-Based Systems. Applications, Part III, Communications in Computer and Information Science 855, Springer 2018. Communications in Computer and Information Science (CCIS) of Springer is abstracted/indexed in DBLP, Google Scholar, EI-Compendex, Mathematical Reviews, SCImago, Scopus. Please, notice that one full registration will allow acceptance of one paper; each additional accepted paper associated with the same registration will be subject to an additional fee.